One of the most common vascular disease questions asked by patients is, “What are Varicose Veins?”. Varicose veins are swollen veins that you can see through your skin. They often look blue, bulging, and twisted. Left untreated, varicose veins may worsen over time. Varicose veins can cause aching and feelings of fatigue as well as skin changes like rashes, redness, and sores. As many as 40 million Americans, most of them women, have varicose veins. When you are in the upright position, the blood in your leg veins must work against gravity to return to your heart. To accomplish this, your leg muscles squeeze the deep veins of your legs and feet. One-way flaps, called valves, in your veins keep blood flowing in the right direction. When your leg muscles contract, the valves inside your veins open. When your legs relax, the valves close. This prevents blood from flowing in reverse, back down the legs. The entire process of sending blood back to the heart is called the venous pump. When you walk and your leg muscles squeeze, the venous pump works well. But when you sit or stand, especially for a long time, the blood in your leg veins can pool and the pressure in your veins can increase (read more about how prolonged sitting and standing can cause vein problems). Deep veins and perforating veins are usually able to withstand short periods of increased pressures. However, if you are a susceptible individual, your veins can stretch if you repeatedly sit or stand for a long time. This stretching can sometimes weaken the walls of your veins and damage your vein valves. Varicose veins may result. Spider veins are mild varicose veins. They look like a nest of red or blue lines just under your skin. Spider veins are not a serious medical problem, but they can be a cosmetic concern to some people, and they can cause symptoms of aching pain and itching in others. If you have varicose veins, your legs may feel heavy, tired, restless, achy or painful. Standing or sitting for too long may worsen your symptoms. You may also experience night cramps. You may notice small clusters of veins in a winding pattern on your leg, or soft, slightly tender knots of veins. Sometimes, the skin on your legs may change color, become irritated, or even form sores. 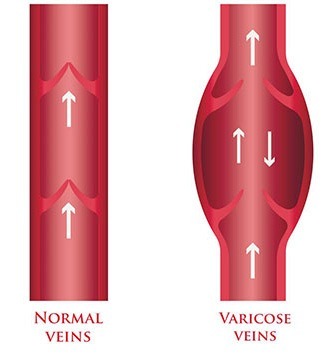 Learn more about varicose vein symptoms. Women are more likely than men to develop varicose veins. Varicose veins usually affect people between the ages of 30 and 70. What tests will I need to Diagnose Varicose Veins? Our physician asks you questions about your general health, medical history, and symptoms in addition we will conducts a physical exam. We will examine the texture and color of any prominent veins. A duplex ultrasound of the veins will be performed to measure the speed of blood flow and to see the structure of your leg veins. The test can take approximately 20 minutes for each leg. Miami Vein Center has a comprehensive vascular lab to do this test, which has been accredited for over a decade by the Intersocietal Commission for the Accreditation of Vascular Laboratories (ICA-VL). Book a consultation to enjoy personalized and attentive care.